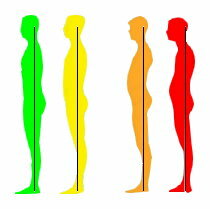 Like obesity, posture has generally been ignored by medical professionals because it was perceived as something they could do little about. Like dieting, posture improvement was thought of as requiring a conscious effort with which most patients would not comply. The endemic proportion of obesity has brought gastric surgery to the forefront. Eating habits, nutrition and diets are emphasized more as well as the importance of exercise. Still a stepchild, the attention given to posture is rapidly increasing because of its direct impact on musculoskeletal disorders and secondary impact on inactivity, obesity, as well as other health problems like cardiovascular disease and adult onset diabetes. And now, with ProKinetics® Insoles, the compliance required is reduced to making sure the insoles are in the shoes. And unlike orthotics, ProKinetics® Insoles are comfortable to wear, maintains a positive sense of contact with the ground, and fit in the shoes the patient already has. The enhanced foot mechanics translates to postural improvements which generally relieves pain and increases opportunities for increased physical activity. Today, focus on posture is more important than ever because of the world we live in, the way we live, and the work we do. The effects from poor posture and musculoskeletal disorders, rank second only to the common cold for lost productivity, second for OTC and prescription drug sales, and number one reason for making a doctor's office visit. Over 80% of the population has "normal" by prevalence, yet dysfunctional feet. Spending 99% of their walking and standing time on flat, hard surfaces aggravates this problem. In the US alone, some 80 million baby boomers are feeling the effects of their dysfunctional feet and bad posture. 70-80 million people regularly exercise and could significantly benefit from improving their postural foundation. Kids and teens experience musculoskeletal problems earlier as they generally are less active and have less muscular strength to protect their joints. Even though insurance companies spend virtually nothing on prevention, and traditional medical practices may be too restricted to offer anything but acute care, an increasing number of people are interested in doing what they can to remain healthy, to escape the pain, expense, and inconvenience of posture related illness. Including posture as part of your musculoskeletal evaluation and recommending ProKinetics® Insoles to your patients is good business for all concerned.